Carbon ceramic brakes also called ceramic composite brakes is a version of the fixed caliper disc brake and is used on supercars and high performance vehicles. The difference or improvement in the carbon ceramic brakes can be credited to the use of different materials and changes in the design but it operates in the same way. The materials used will be a carbon ceramic material for the brake pads instead of asbestos or semi metallic brake pads and the rotors are a combination of carbon, silicon and a resin. The design incorporates vents inside the rotor or disc that runs from where the hub ends to the outer edge of the rotor. The rotor or disc is seperate from the hub and is usually bolted onto the hub. These designs can be found on ordinary disc brakes but in the minority. The ability to maintain their functionality at high temperatures due to the fact that they don't keep the heat. This is their greatest advantage. In high performance vehicles as much as six tons of force can be applied to stop your vehicles producing alot of heat, over 1000 degrees F and the boiling point for brake fluid will be between 550 to 700 degrees F but carbon ceramic brakes can dispurse the heat before it reaches the brake fluid. Frequent and heavy braking from high speeds is effectively achieved for longer. There is less dust build up from carbon ceramic brakes. The dust from the metal pads have static electricity which causes the dust to have magnetic properties so the dust remains on the metal parts around the brakes. 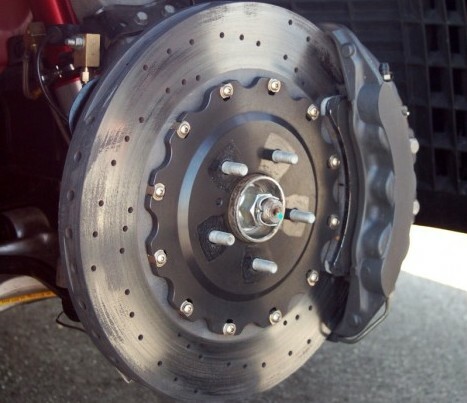 Carbon ceramic brakes produce less noise during braking. Being different from the regular disc brake in the materials used but similar in design the carbon ceramic can also benefit from anti lock brakes and electronic brakeforce distribution . The one minor issue with ceramic composite brakes are situations when you're using the vehicle with light application on the brakes while the brakes are still cool for example when you're driving the vehicle for the first time in the morning or anytime when the vehicle has been resting for hours and the brakes are cold it will feel a little grabby but it still works.